Christine Akello thought she was safe. Having survived about three decades of civil war and displacement in Uganda, she thought she had seen the worst. "What is tough is thinking that you made it through a long grueling war, that you can rebuild your life, raise your family well and have a little peace, only to be confronted with another war in your very own backyard," Akello said. 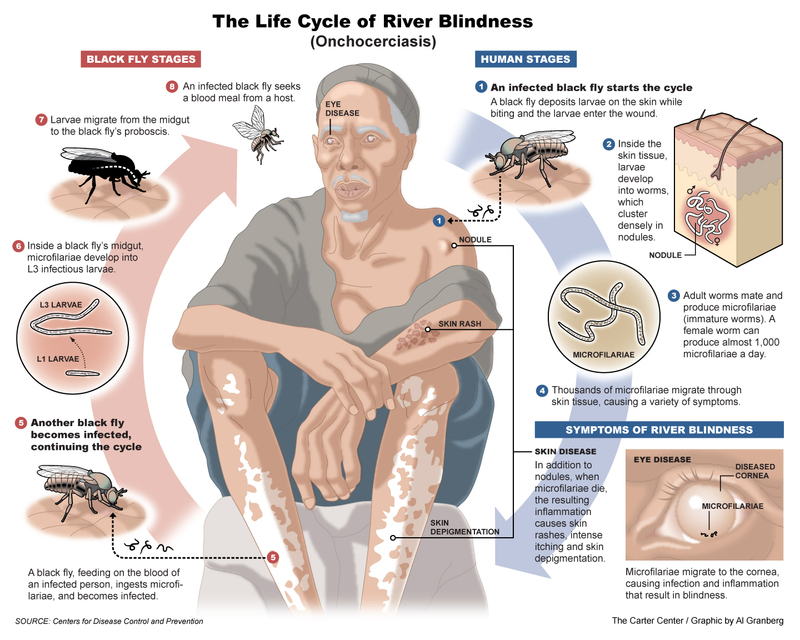 Her new enemy was river blindness, a parasitic disease transmitted by black flies which thrive in the fast-moving streams and rivers throughout Uganda and much of sub-Saharan Africa. Repeated black fly bites infect people with nematode parasites that grow and produce thousands of baby worms which cause severe itching and skin disease, and when they migrate to the eyes, compromised vision or blindness. When Akello first started experiencing intense itching all over her body in 1996, she used maize cobs to scratch the worst spots, but the relief was only temporary. "The body itches deepened, showing no signs of stopping," Akello recalled. "Nodules started spreading all over my body on my arms, legs, stomach… literally everywhere. My fears were now getting even worse." "Slowly my eyesight started weakening," she said. 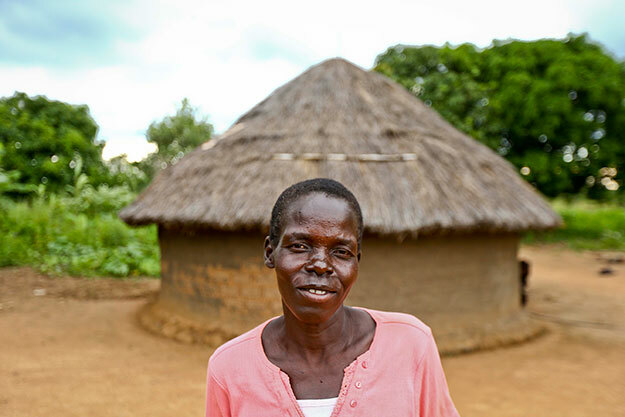 At the time, Akello and her family were living on the run from the Lord's Resistance Army (LRA), desperately shuttling between their homes, the bush, and the tent camps for internally displaced people (IDP). 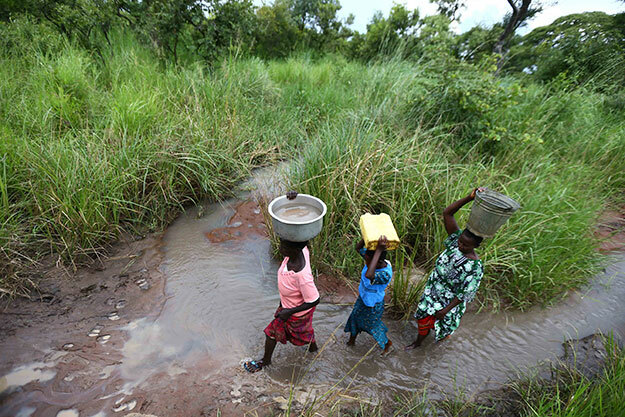 The LRA years, beginning in the late 1980s, represented a vicious chapter in Ugandan history, as rebel leaders - Alice Lakwena and her cousin Joseph Kony - and their followers ruled through violence and fear. "You wanted to run as fast away from the attackers as possible," Akello said. "My weakening vision was becoming a danger to those I ran away with, but I had a loving family who kept close and guided me throughout those trying times." At the IDP camps, Akello was treated for all the painful symptoms of river blindness, but the drugs were ineffective or had serious side effects. In 2009, The Carter Center and the Ugandan Ministry of Health, along with other partner organizations, began distributing Mectizan®, donated by U.S. pharmaceutical company Merck. Mectizan kills the baby worms, and twice-yearly doses rapidly halts the transmission of the disease altogether. "That was the beginning of my near full recovery," Akello said. "My eyesight is now back to near normal, and I can do my day-to-day regular family duties. I do struggle to see during the night, but I am still on medication and am hopeful to have a full recovery." The effectiveness of the drug is clear, but so is the need to continue treating people who remain at great risk. "Almost every family I know has someone currently fighting this disease," Akello said. Her pain is heartfelt, as she lost one of her six children to river blindness, combined with nodding syndrome, a mysterious malady that affects the youngest, most vulnerable patients. Another of her children is fighting the same combination, and a third child has made a full recovery from river blindness after receiving Mectizan from community drug distributors. "My other three children are healthy," Akello said. "But out of fear, they, too, are taking the same medication." A mother's concern for the health of her children is much the same in any language, any geographic area. Eliminating river blindness in Uganda by 2020 is a priority not only for families, but the nation. Fact: Inspired by the success of river blindness elimination activities in the Americas, Uganda is positioning itself to be one of the first endemic countries in Africa to wipe out the disease through health education and drug treatments.